Well that didn’t take long. Only days after Chevrolet teased us with a single photo of the 2016 Silverado, GMC follows suite with its refreshed 2016 Sierra. Only GMC went a step further – or really nine steps further – with a bank of 10 photos of the updated full-size truck. The new Sierra’s refresh takes after the 2016 GMC Yukon line of SUVs, using a similar C-shaped LED headlight assembly and matching C-shaped rear taillights. The Sierra’s new grille is much larger, as it extends further down into the revised bumper. Up top, the grill now has a center-mounted opening between itself and the hood’s power dome bulges. Each trim level receives a different grille treatment. 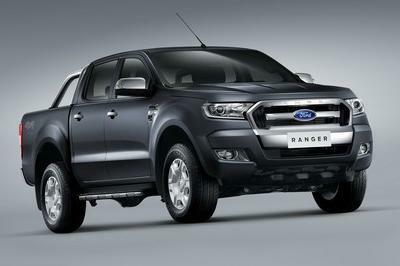 The SLT has a more traditional slotted grille, still embossed in chrome, but with a less flashy appearance. The range-topping Denali, on the other hand, get’s the classic cheese grader grille fully drenched in chrome. The All Terrain trim receives a more subdued appearance with its grille coated in a smoky gray color. The new bumper on all non-work-truck trim levels now contains LED fog lights and chrome-colored plastic surrounding the tow hooks. Like the Silverado, there doesn’t appear to be any difference in the cab or bed’s bodywork. 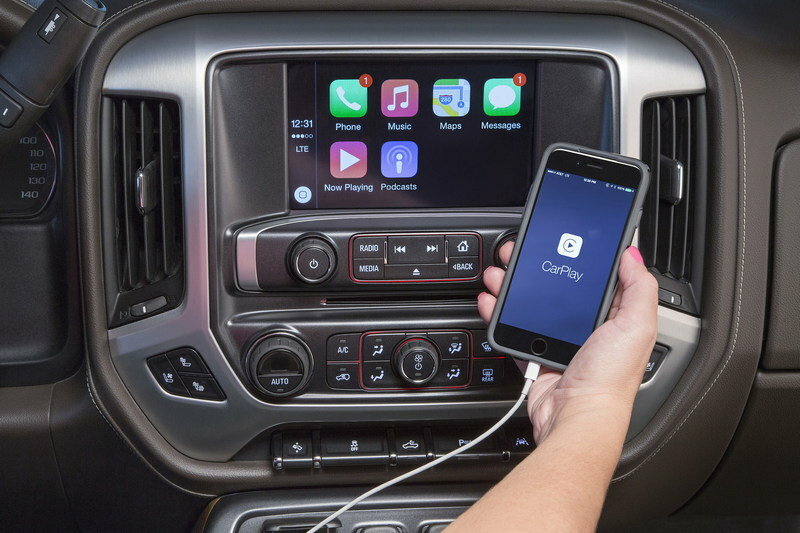 Like the Silverado, the GMC gets an updated version of its infotainment software that now includes Apple CarPlay and Android Auto capabilities. The integration of both aftermarket systems allows compatible smartphone users to connect their device to the GMC’s IntelliLink infotainment system and display a condensed version of their phones’ display. Though GMC didn’t make mention of powertrain updates, expect GM’s new eight-speed automatic to appear in more trim levels. Expect more news in the coming months as both Chevy and GMC prepare for the 2016 model year. 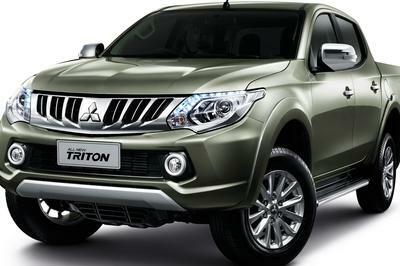 Both trucks will arrive at dealers in the fourth quarter of 2015. 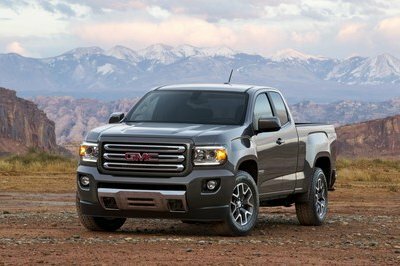 Both the GMC Sierra and Chevrolet Silverado are highly competitive trucks in the American market place. As the new 2015 Ford F-150 gears up and becomes more accepted in the market, and as Ram continues to break sales barriers with its truck, GM is right to introduce a mild refresh on their trucks. Though nothing has changes with the EcoTec3 lineup of engines, the more widespread use of the new eight-speed automatic should help improve fuel economy across the board, helping the trucks compete against Ford’s EcoBoost and Ram’s EcoDiesel powerplants. 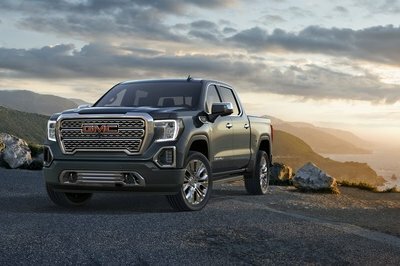 GMC’s best-selling truck has great momentum coming off its best June since 2006 and 12 consecutive months of year-over-year sales gains. 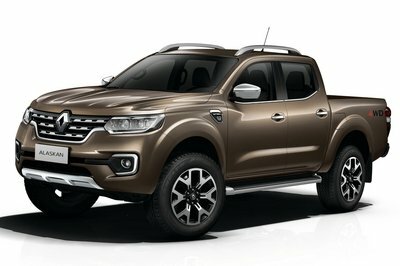 With exterior styling as its top reason for purchase, the new truck adds key design elements: LED “C-shaped” signature daytime running lights and LED headlights; new front fascia and grilles for each trim level; new LED fog lamps; new bumpers; and new “C-shaped” LED taillights. The new Sierra will be available in the fourth quarter of this year, with additional details and information on the new model released in the coming months.